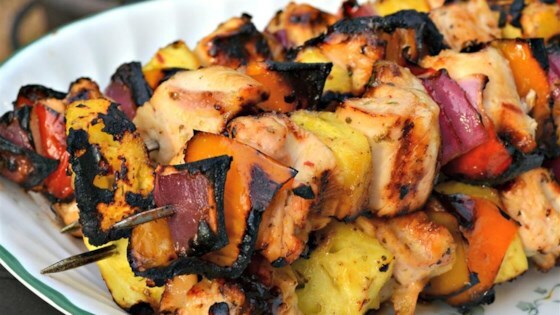 "Caribbean-inspired chicken kabobs. You can substitute green pepper for the red pepper, if desired." Whisk cream of coconut, lemon juice, bouillon, marjoram, garlic powder, and red pepper flakes together in a bowl until marinade is smooth. Combine chicken, red bell pepper, onion, and pineapple in a shallow dish and cover with 1/2 of the marinade. Cover bowl with plastic wrap and refrigerate, 4 to 6 hours. Remove chicken, vegetables, and pineapple from the marinade, and shake off excess. Discard remaining marinade. Thread chicken, vegetables, and pineapple onto skewers. Grill kabobs on the preheated grill, basting with the remaining marinade occasionally, until chicken is no longer pink in the center and the vegetables are tender, 5 to 10 minutes per side. See how to make a quick, flavorful marinade for grilled chicken kabobs. Too much lemon juice-really tart. Delicious! Followed the recipe to a "T" and wouldn't change a thing. We served ours with long grain rice and an ice cold Bud Light Lime! Yum! Great topical flavor!! Next time, I will include more bell peppers and onions! This was awesome. I will definitely make again. I love when my husband asks for seconds! I marinated it for 6 hours. Maybe I should have marinated it for over night. May be pineapple juice would make it more flavorful than lemon juice.